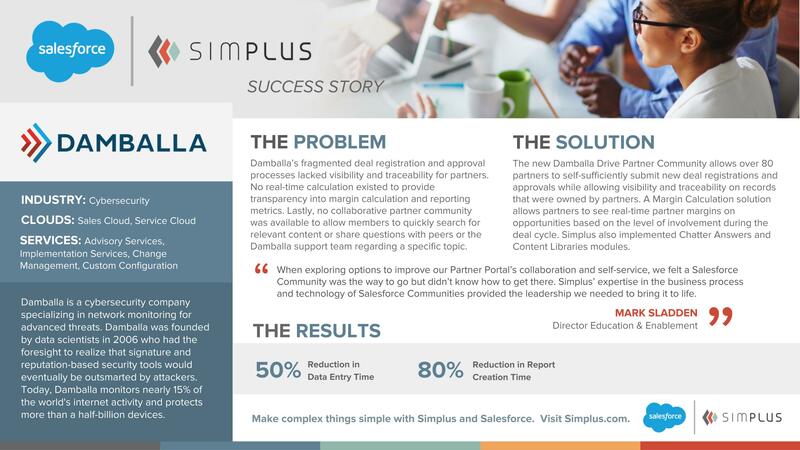 Simplus worked with Damballa, a cybersecurity company specializing in networking monitoring, to improve its Sales Cloud and Service Cloud implementations for increased deal visibility and a more collaborative partner community. Our story with Damballa is the perfect use case for those wondering how to leverage Salesforce Communities for self-service capabilities. We created a new partner community for Damballa that allows over 80 partners to utilize self-service to submit deal registrations and approvals. We also implemented a Margin Calculation solution which lets partners see real-time margins on opportunities. Simplus also set up other modules to increase productivity. All in all, it meant a 50% reduction in data entry time and an 80% reduction in report creation time — more time to provide quality service and an intuitive UI for Damballa’s customers!